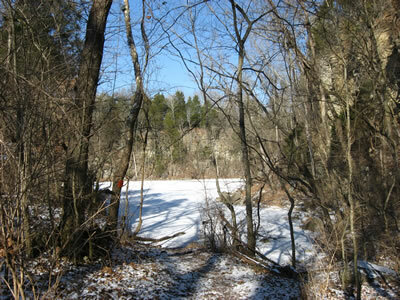 While hiking trails at the Narrows of the Harpeth, a hiker we met highly recommended Hidden Lake. 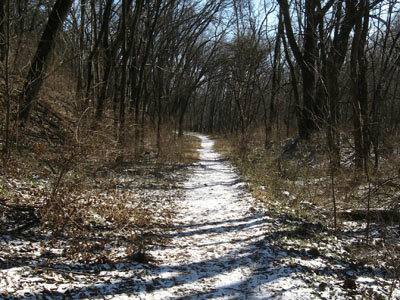 He claimed it was similar to trails in the Rockies. That was all we needed. 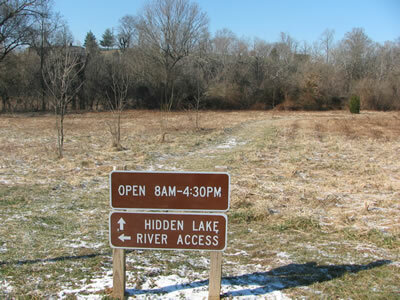 A little research found that Hidden Lake was part of the Harpeth River State Park; but was only given a short comment on the Park's web site. Directions: Take Exit 192 (17 miles west of Nashville), McCrory Lane. 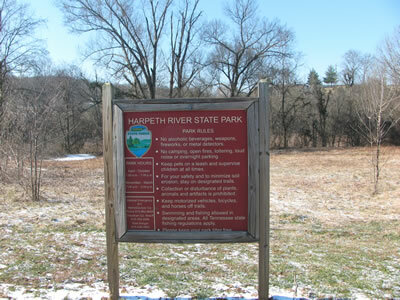 Go north for .75 miles, cross the Harpeth River and the parking area is to the left (west). 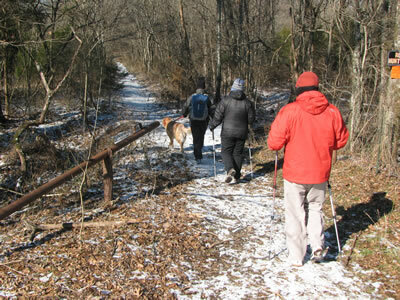 The trailhead had ample parking; but the area is also used as a river access, mile 49.8 on the Harpeth River. 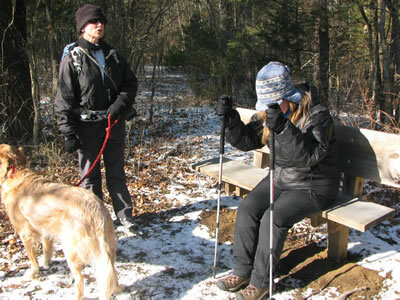 The kiosk was divided between information for the River Trail and the Hidden Lake Trail. From the trailhead the trail leads across the field following a mowed path/road. At .20 miles the trail comes to the first of several junctions. 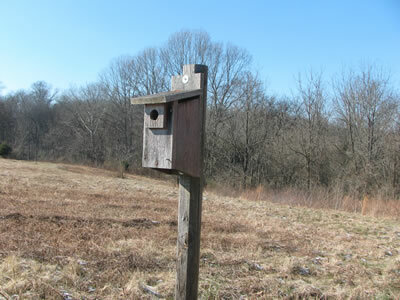 The Bluebird Trail branches off to the right and heads north. 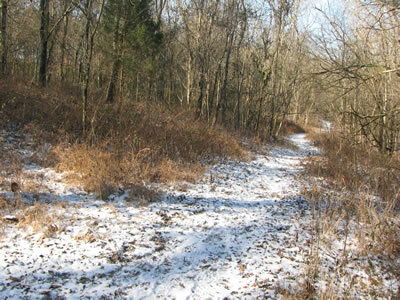 The trail leaves the field and follows an old road as it enters the forest. 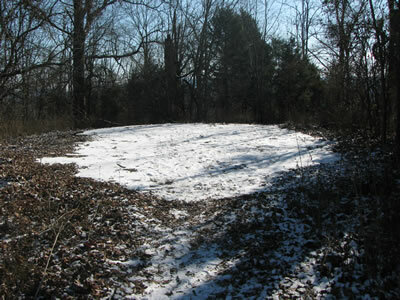 Remains of the former users of the land are evident. In .25 miles another junction is reached. Right - goes to the overlook. Left - goes to the lake. Going right to the overlook, the trail (road) climbs giving views of a small lake. At .05 miles an old building is to the left and a trail goes to the left. 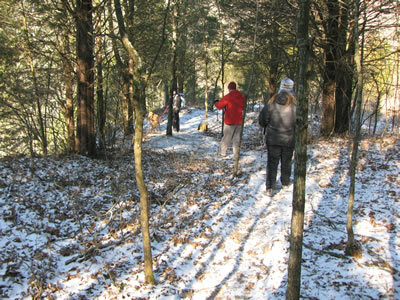 The trail is a shortcut, but steeper path to the overlook. Continuing straight on the road the trail comes to a tee after .15 miles. Straight - goes to the rim above the lake. 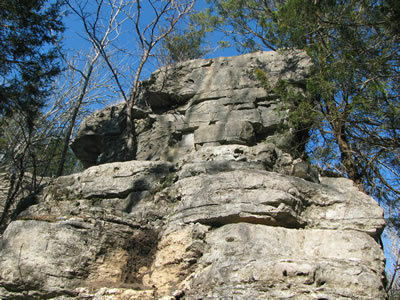 Left - goes to overlook. Going left it is .15 miles to the top and the overlook. 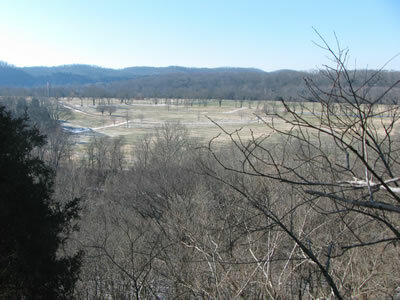 To the south is the Middle Tennessee Veterans Cemetery. The remains of the dance floor is easy to find. It is the only flat surface - it looks like some form of pavement. It is .80 miles from the trailhead to the overlook. Leaving the overlook return on the same trail for .10 miles. A trail leave the road going left or west. Large fuel tank, looks like a submarine! After descending a few hundred feet (distance) the trail begins contouring above the lake. At .10 miles a junction is reached. 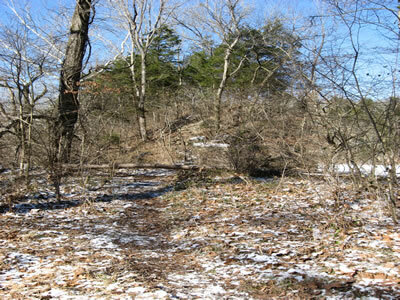 Left - is an old dilapidated trail going down to the lake. Right - returns on the road to the tee. Straight - continues around the rim of Hidden Lake. Going around the rim the trail follows the western side to the south edge in .10 miles. 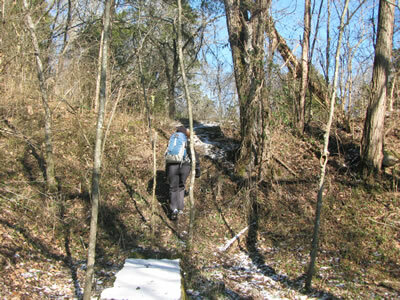 The trail is slightly hard to follow as it descends. 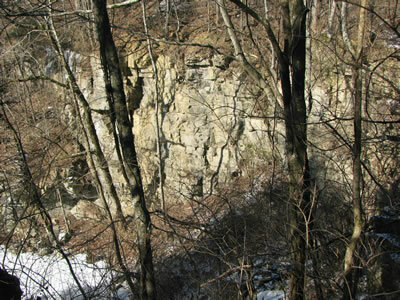 It goes right for a few feet and then goes back left as it descends a few feet below the ridge. 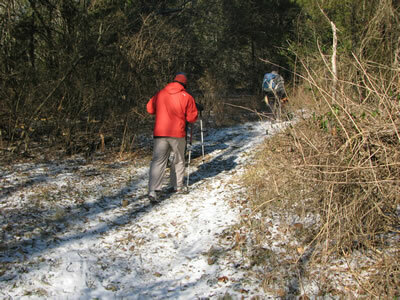 Trail descending from the ridge. The lake is to the right. The trail continues on a gradual descent to the lake. A road leaves the lake access giving an easy stroll for .20 miles to the junction just past the small lake. 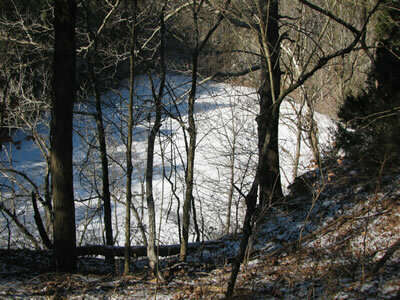 The small lake cannot be seen from the trail/road. 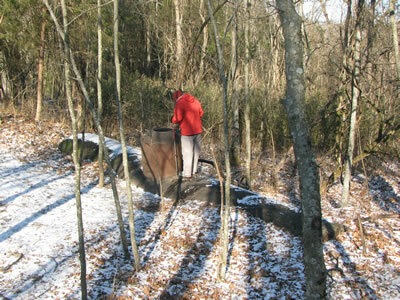 Just before the junction, a trail branches to the left and climbs a short incline to access the small lake. There is a bench located at the lake. 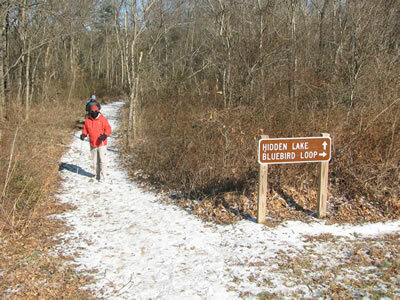 From the junction, return on the trail/road for .25 miles to the junction with the Bluebird Trail. Go left to take the .25 mile loop around the field and back to the trailhead.